A French Culinary Love Affair While attending cooking school in Paris in her 20s, food writer Lynda Balslev fell in love with the unfussy comfort food of her neighborhood bistros. She returned to the U.S. years later with recipes that satisfy her enduring taste for the flavors of the French countryside. 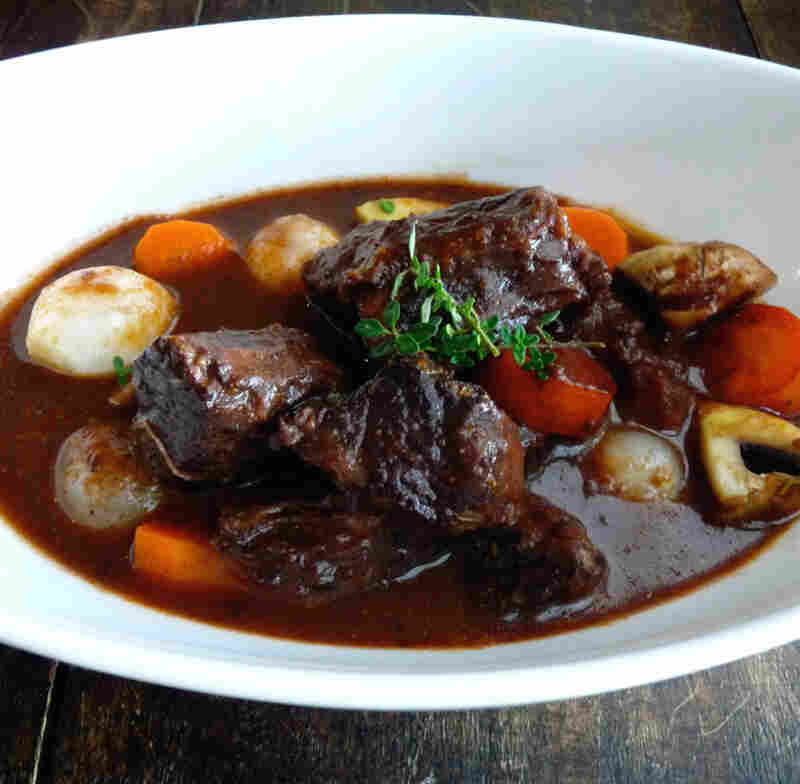 Get recipes for Beef Bourguignon (above), Frisee And Escarole Salad With Lardons, Potato Gratin and Tarte Tatin. As many stories set in Paris are, this is a love story. Yes, there was a man involved, but that's not what I am talking about. This is a story about my love affair with French country food. As I tucked into a steaming bowl of pot-au-feu or spread chunky rustic pate on a crusty baguette, I was transported to the countryside, reaping the benefits of generations of expertise directed to the kitchen. It warmed me and fed my palate and soul. I was in love and at home. In 1991, I moved from Boston to Paris to study cooking at Le Cordon Bleu. At the time, I was hardly predisposed to the French culture or cuisine. None of my ancestors were French. I studied Spanish in school. And my eating style was certainly not French. I did not eat red meat, avoided butter and treated cheese like the forbidden fruit. I shunned caffeine and drank little wine. So what possessed me in my 20s to sell my house, put a design career on hold and move to France? Perhaps it was the lack of meat protein in my diet that affected my reasoning skills. Or, perhaps it was the subconscious need to seize the excuse of a new culture and a gap of an ocean to allow me to just live a little. Whatever the case, I set off with two duffel bags and many unanswered questions. (Where would I live? How would I open a bank account? Why did I study Spanish?) Upon arrival, my life slowly fell into place. A room in a tiny apartment was rented. A bank account was (with difficulty) opened. I was immersed in French, and quickly began to pick up food terms. And my life shifted. Each day, I walked across the city from my apartment in the 18th arrondissement to school in the 15th arrondissement. I traversed neighborhoods and crossed boulevards and the river Seine on my way to class. For breakfast, I stopped in cafes along the way and ordered a tartine, a crusty baguette slathered with butter and preserves, and cafe au lait. I passed open-air markets, where I purchased baguettes, fresh fruit and runny cheese for my lunch. I continued on, passing restaurants and bistros, pausing to read menus posted outside their doors, window shopping for dinner just as I would for shoes. At school, I learned to make sauces, stocks and reductions, how to clean fish and poultry, sharpen and use my knives. I learned the basics of pastry and how to cook an egg. I was instructed on how to cut vegetables, roast salmon, prepare coq au vin. I shared my food from class with the dishwasher, who tirelessly worked in our kitchen, cleaning our pots and pans. I was eager to return home from school without leftovers; I had other plans for dinner. My love affair had started. I had a rendezvous with a French bistro for dinner. I discovered the neighborhood bistro early on. Accessible, convivial and unfussy, the bistros beckoned to me when I returned home from school each day, tired and hungry with no interest in more cooking. Their entrances were warmly lit and festively decorated. Sounds of conversation, laughter and the wafting aroma of delicious food coaxed me into their cozy environments. I would slip into a seat at a small table in the middle of the bustle, sitting elbow to elbow with my fellow diners. I was alone yet in good company, sharing in the enjoyment of eating. The cuisine was consistently good — comfort food unpretentiously rooted in the French countryside. Each bistro specialized in the cuisine of a particular pays (region), usually determined by the birthplace of the chef. The common theme was a respect for terroir, the uniquely French term that gives identity and meaning to the food and wine of a particular region. It reflects the soil, climate and geography of the land. It also reflects the history, culture and traditions of the people who produce the food. The menus proudly reproduced and refined these traditional provincial dishes, showcasing seasonal ingredients from local artisans and growers. As I tucked into a steaming bowl of pot-au-feu or spread chunky rustic pate on a crusty baguette, I was transported to the countryside, reaping the benefits of generations of expertise directed to the kitchen. It warmed me and fed my palate and soul. I was in love and at home. My love affair with French country food continues to this day. I cook in this style for family and friends, mindful of the seasons and eating as locally as possible. And that man? We were married, but that's another story. 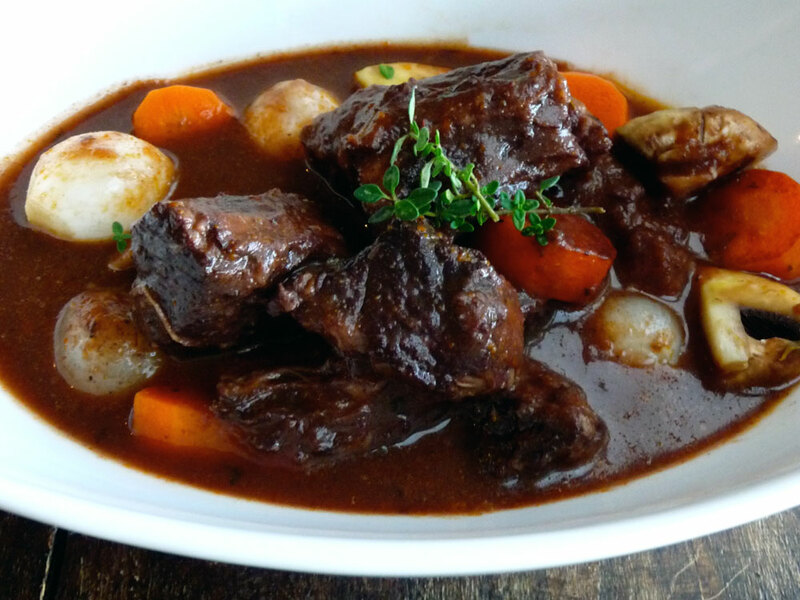 This is a rustic peasant dish hailing from the Bourgogne countryside, featuring the region's red wine. 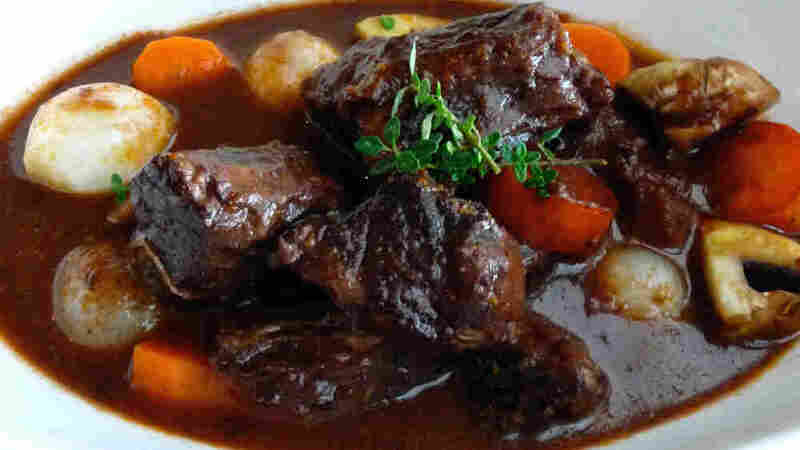 Beef slow-cooks in red wine until it's falling-apart tender, while its juices blend with the wine and vegetables for a rich, flavorful stew. This recipe is best prepared one day in advance to allow the flavors to develop overnight in the refrigerator. Before reheating, skim solidified fat from top of stew. Reheat over medium-low heat, or in a 325-degree oven. Heat 2 tablespoons olive oil over medium heat in a large ovenproof pan. Season beef with salt and pepper. Working in batches, add beef to pot in one layer and brown on all sides. Transfer to a bowl. Add cognac to pan and deglaze pan over medium-high heat, scraping up bits. Allow to reduce by half. Pour cognac over beef and set aside. Preheat oven to 325 degrees. Coarsely chop 2 carrots. Heat 2 tablespoons olive oil in same pan. Add chopped carrots, onion and garlic. Saute 3 minutes over medium heat. Add beef, wine, stock, tomato paste and thyme. Beef should be covered by the wine and stock. If not, add more stock to cover. Bring to boil, reduce heat to low, and simmer 2 minutes. Cover pan and place in oven. Bake until meat is tender, 2 to 3 hours. About 30 minutes before beef is done, cut remaining carrots in 1/2-inch-thick slices. Steam or blanch carrots until crisp tender; drain. Saute mushrooms and pearl onions in a skillet with 1 tablespoon olive oil until they turn light golden brown. When beef is tender, remove from oven. Strain liquid from stew into a saucepan. Boil liquid until sauce is reduced by half and has a sauce consistency, skimming fat from surface. Add sugar. Season to taste with salt and pepper. Pour sauce back over beef. Add carrots, mushrooms and onions to stock. Simmer 15 minutes. 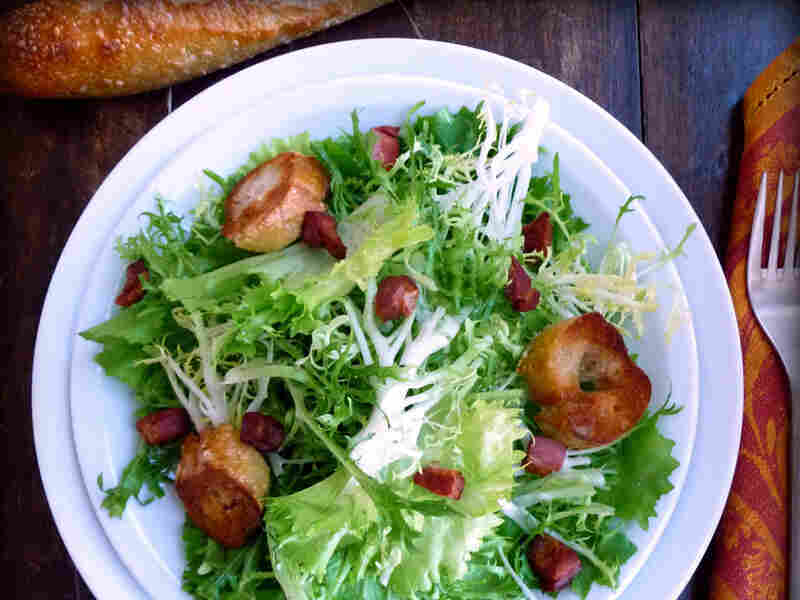 This salad is inspired by a traditional salad from the Lyon region of France. Assertive frisee and escarole leaves are scattered with crispy lardons (bacon cubes) and croutons, and finished with a Dijon vinaigrette. The original salade Lyonnaise would have you quickly saute the leaves in the warm bacon drippings and top the finished salad with a 4-minute poached egg. This lighter version simply browns the croutons in the bacon fat and omits the egg. Place frisee and escarole in a large bowl. Heat a skillet over medium heat and add bacon. Cook until fat is rendered and bacon is crispy golden. Transfer bacon with a slotted spoon to a plate lined with a paper towel to drain. Pour off all of the bacon fat except 1 tablespoon. Return skillet to stovetop. Add baguette slices in one layer in batches. Cook over medium heat until golden on both sides, turning once. Transfer bread to another plate lined with a paper towel. Combine vinegar, mustard, salt and pepper in a small bowl. Slowly pour in olive oil, whisking constantly to emulsify. Pour dressing over greens. Toss to combine. Arrange salad on serving plates. Top with bacon and baguette croutons. This rich dish combines potatoes, cream and alpine cheese. As you eat this, close your eyes and you might imagine you are in a chalet in the Savoyard Alps. Comte may be substituted for the Gruyere. Combine creme fraiche, garlic, salt, pepper and nutmeg in a bowl. Mix together. Butter a rectangular or large round ceramic baking pan. Arrange half of the potato slices, overlapping in 2 layers in pan. Spread half of the creme fraiche mixture evenly over the potatoes. Sprinkle half of the Gruyere over. 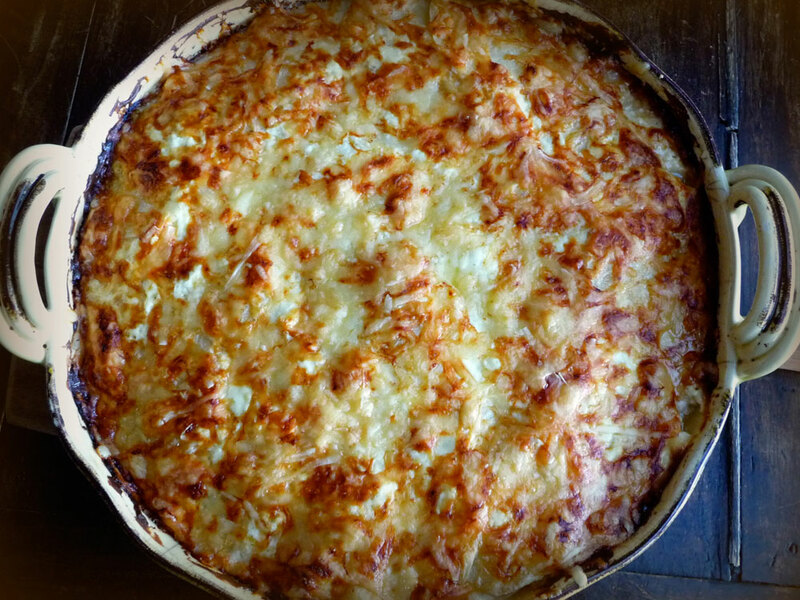 Top with remaining potatoes, overlapping. Spread remaining creme fraiche mixture over potatoes. Sprinkle Gruyere over. The Tatin sisters had a restaurant in the French village of Lamotte-Beuvron at the turn of the 20th century. The story goes that they made an error while baking a traditional apple tart, when the pastry was omitted from the bottom of the tart pan. 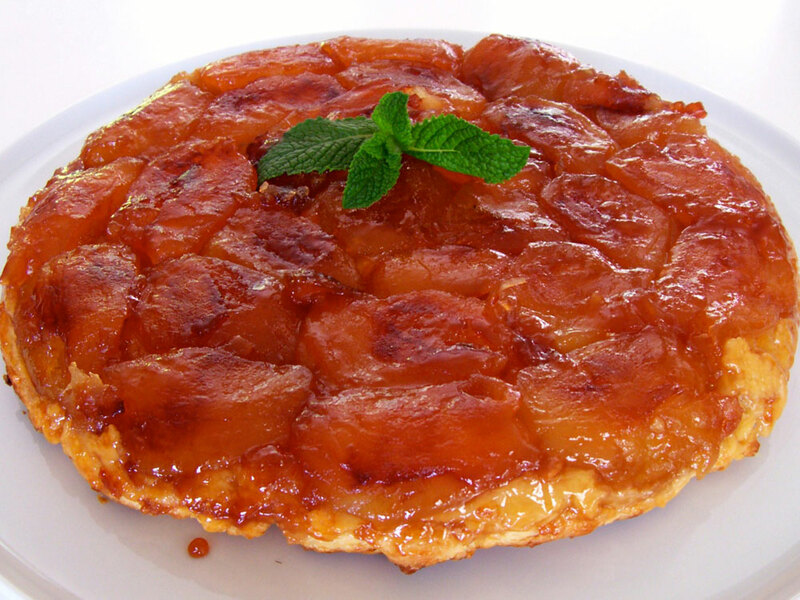 Not to be deterred, the sisters added the pastry as an afterthought on top of the fruit and, voila, tarte Tatin. Combine flour, sugar and salt in a large bowl of a mixer fitted with a whisk attachment. Mix well. Add butter and mix at medium-low speed until butter is size of peas, 2 to 3 minutes. Add sour cream and mix until moist clumps form. Gather dough into ball, flatten and wrap in plastic. Refrigerate for at least 2 hours. (Can be made one day ahead. Refrigerate until use.) Let soften slightly at room temperature before rolling out. Arrange butter over bottom of large oven-proof skillet (preferably cast iron). Sprinkle 1 cup sugar over butter. Place skillet over medium-low heat and cook until butter melts, sugar begins to dissolve and mixture starts to bubble, about 3 minutes. Arrange apples, core side up, around edge of skillet, placing tightly together. Place remaining apples in a circle in center of skillet. Sprinkle with the remaining sugar. Set skillet over medium-high heat. Boil until a thick amber-colored syrup forms, occasionally turning skillet to ensure even cooking, about 30 minutes. While apples cook, fill in gaps with additional apple quarters. Remove skillet from heat. While apples are cooking on stove, preheat oven to 425 degrees. Roll out pastry on floured surface or parchment paper to a round shape to fit size of skillet. Place dough over apple mixture once removed from stove, pressing dough down around the apples at edge of skillet. Cut 4 slits in top of pastry. Brush pastry with some of the egg glaze. Bake tart until pastry is golden brown, 30 to 40 minutes. Remove from oven and cool 1 minute. Cut around edge of skillet to loosen pastry. Place large platter over skillet. Using oven mitts, hold skillet and platter together tightly and invert tart onto platter. Cool at least 30 minutes. Cut in wedges and serve warm or at room temperature with whipped cream or vanilla ice cream.